What do a rockabilly musician turned cinematic swamp monster, an instrument that lent its name to a weapon, and the creator of Schoolhouse Rock! have in common? They all come from Arkansas. The Butler Center for Arkansas Studies, a department of the Central Arkansas Library System (CALS), will host a cocktail party to celebrate the release of the Encyclopedia of Arkansas Music, a new Butler Center Book, on Thursday, September 19, at 5:30 p.m. in the Main Library’s Darragh Center, 100 Rock Street. Reservations are appreciated, but not required. To RSVP, email kchagnon@cals.org or call 918-3033. The Encyclopedia of Arkansas Music is a special project of the Encyclopedia of Arkansas History & Culture (EOA), an online encyclopedia launched in 2006 by the Butler Center. This colorful, photo-filled reference work spanning all aspects of Arkansas’s musical past and present includes more than 150 entries on musicians, ensembles, musical works, and events. Also included is a musical map of Arkansas showing important musical sites-both defunct and still in existence-including the Rock ‘n’ Roll Highway. 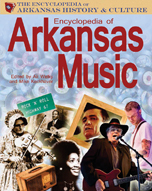 Covering the genres of blues/R&B, classical/opera, country, folk, gospel/contemporary Christian, jazz, rock, and rockabilly, this encyclopedia has something to interest any lover of Arkansas music and Arkansas history-as the state’s past, present, and future are tied to its music. The Encyclopedia of Arkansas Music is available at River Market Books & Gifts, 120 River Market Ave., and from the University of Arkansas Press, Butler Center Books’ distributor, www.uapress.com. Butler Center Books is a division of the Butler Center for Arkansas Studies. The Butler Center’s research collections, art galleries, and offices are located in the Arkansas Studies Institute building at 401 President Clinton Ave. on the campus of the CALS Main Library. For more information, contact Rod Lorenzen at (501) 320-5716 or rlorenzen@cals.org.